Jill Stuart Rouge My Dress Lipstick for Fall 2015 arrived in Japan earlier this Summer in ten permanent shades (and one limited edition shade). The new Jill Stuart Rouge My Dress is a “melty” cream lipstick that promises to provide beautiful color, shine, and moisture to lips. Jill Stuart Rouge My Dress are $24 each and come housed in a very elegant square barrel with a pink Swarovski element graving the front. I have a vast collection of Jill Stuart makeup that I’ve been collecting from as far back as 2006 and the packaging, as you can see, is part of the reason I love it so much. The barrel has a gorgeous floral vine that wraps around the entire tube and is done up in a mirror finish. The thing about Jill Stuart makeup though is it looks quite weighty and heavy but it’s actually all show with little weight behind it. So you might think, “Wow what a stunning piece of makeup!” but upon touching it you might be slightly shocked how light and flimsy the packaging is. It’s an odd contrast to be sure! 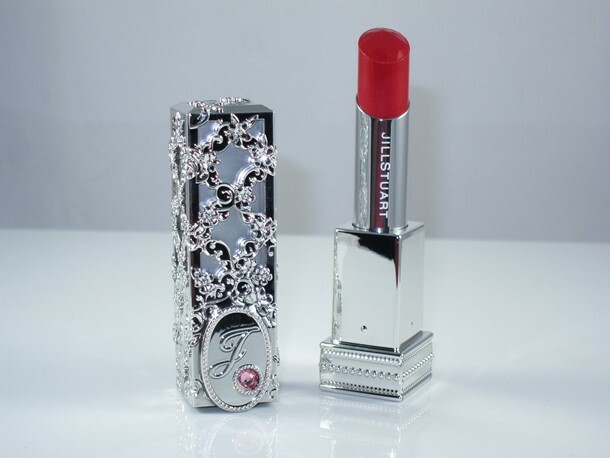 I don’t think the light feel of the barrel takes anything away from the elegance but it’s still kinda of shocking as one would expect these to weight in as heavy as say a Guerlain Rouge G.
Jill Stuart Rouge My Dress is really a lot like many of Jill Stuart lipsticks formula. I think the packaging changes but the formula has super subtle differences and just feels repromoted to me. 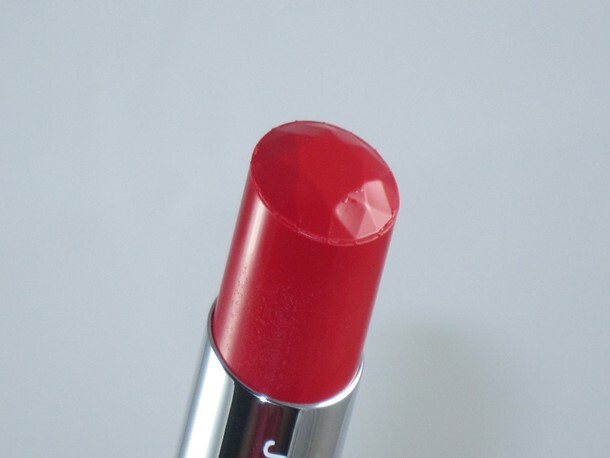 Rouge My Dress has a melty consistency that Japanese lipsticks are known for with a nice, smooth consistency that glides onto lips with a semi-slick feel. It provides very nice moisture with a very light, thin texture that sits comfortably on lips. It has a luster-like finish that looks subtly shiny on lips. The formula does have very nice pigmentation as well. These are formulated with avocado oil for moisture as well as rosemary extract and lavender oil. All Jill Stuart Lipsticks have a perfume-y taste and flavor that’s rose-like and pleasant to my mouth but might not be for everyone particularly sensitive users. 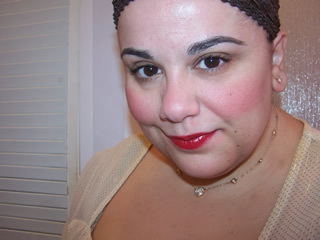 I thought the wear quite nice on the lipstick at around four hours without feathering, migrating, or sinking into my natural lip line. The formula provided nice, light moisture during that wear as well. I got the shade Red High Heels which is a tomato cherry red on my lips. It’s completely shimmer free and has a nice luster-y finish with a very subtle hint of shine. I think I’m on Jill Stuart overdose at this point in my life because although gorgeous I wouldn’t say the lipstick formula is mind blowing and I think that the Catrice Luminous Lips Lipstick I reviewed yesterday had a better formula at a cheaper price tag. Is that terrible to say? But no doubt that Jill Stuart brings their A game when it comes to gorgeous packaging and very nice wearing lipsticks. Jill Stuart Rouge My Dress is available now and can be purchased from one of my favorite sellers gooddealer.com. haha they are surely coming fast that’s for sure! That packaging is stunning, but the soapy scent/taste would be a deal-breaker for me. Do you think some companies up the anti with their packing b/c they know the product isn’t that good. Such beautiful packaging! I specifically purchased a lipstick bullet maker JUST because I love reusing pretty containers like the PeriPera My Color Lips lipsticks~! I’m totally down for that $24 price tag for these lipsticks! oh gosh this color is beautiful!